Articles and images published in Soviet newspapers on March 8, International Communist Woman’s Day, provide the most obvious examples of how women were used as symbols in a propaganda campaign. These texts and images were clearly intended to convey a certain message about the changing role of women in the Soviet system. In particular, March 8 publications celebrated the achievements of Soviet women in part by comparing their lives to the difficulties of Russian women “in the past,” prior to the revolution, and to contemporary women “outside the Soviet borders,” which included the capitalist countries of Western Europe and the United States and the Asian and African colonial peoples ruled by European governments. 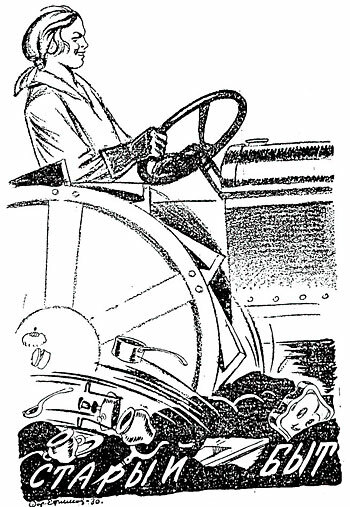 This image contrasts the symbols of woman’s oppression in the “old way of life,” such as cooking utensils and makeup products, with one of the most evocative symbols of the new Soviet order: a young woman driving a tractor. Source: Izvestiia, “Old Way of Life,” March 8, 1930.